You need to understand a bit about publisher submission guidelines, if you want to break into the comic books. 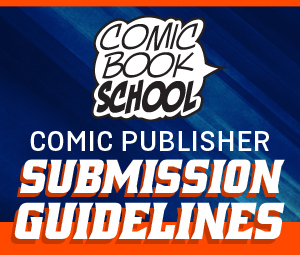 This list of submission guidelines includes links to comic book publishers. Breaking into comics is a real challenge for creators, particularly writers. Every year, I host panels at New York Comicon where I ask comic and book editors to offer advice about breaking in. Just about every comix editor wants the same thing from aspiring artists, which is sequential comic book work. You need to submit more than pinups and sketches. Nothing proves that you can make comics like making actual sequential comics. If you’re interested in breaking into Marvel Comics, check out this interview I did with Joe Quesada, chief creative officer at Marvel. For writers, it’s even more difficult, since an editor can’t review your work at a convention. So creating a comic, having it drawn, and getting it published will give you an edge with editors. I know, I know, it’s a chicken-or-egg thing of “I need something published to get something published,” but there are always small publishers and Kickstarter to help you get your first project off the ground. If you want to work in comic books as a professional, learn about the industry and the publishers you are targeting. Buy (never pirate) the comics they publish, which will help them stay in business as you break in as a pro. Here’s a list of submission guidelines by publisher. Bookmark this and check back. I’ll keep it updated. If you see a broken link, let me know. There’s a reason Marvel and DC are considered “the Big Two.” By sheer sales numbers, they dominate the newsstand and the direct market (comic shops). Marvel and DC tend to be difficult to break into because they have highly desirable superhero characters. For many writers and artists, Marvel and DC are their fantasy dream job. This isn’t true for all creators, but when you go to conventions and see the lines for portfolio review, you know that a lot of people want to get paid to draw and write their characters. I’ve written Deadpool and other comics for Marvel Comics and will tell you that it is a lot of fun. Publisher of Batman, Superman, Green Arrow, Wonder Woman, Justice League, Sandman, Preacher, Teen Titans, Green Lantern, Mad Magazine, Vertigo titles, and many others. Publisher of Spider-Man, The X-Men, Avengers, Daredevil, Iron Man, Hulk, Deadpool, Wolverine, Captain America, Ghost Rider, Thor, The Ultimates, and many others. There are quite a few top independent publishers, and you can debate who they are. Some of them are so large and established that it may not be accurate to call them “indy publishers.” But this is why they are part of the elite “large independent publishers” section. This list is completely subjective and you should feel free to challenge my listings in the comments section below. Publisher of Archie, Jughead, Betty & Veronica, Sonic, Afterlife With Archie, and other comic books and supermarket digests. Publisher of Crossed, Robocop, Friday the 13th, Night of the Living Dead, and many others. Publisher of 3 Guns, Adventure Time, Peanuts, Planet of the Apes, Irredeemable, and many others. Publisher of Hellboy, Star Wars, Buffy, Conan, Buffy, Grendel, Terminator, Ghost, and many others. Publisher of Bionic Man, Battlestar Galactica, Project Superpowers, Shadow, Flash Gordon, Green Hornet, and many others. Publisher of Love & Rockets, Hate, Acme Novelty Library, Eightball, and many others. Publisher of Walking Dead, Invincible, Spawn, Savage Dragon, Chew, Kabuki, Dead @ 17, Saga, Youngblood, and many others. Publisher of Witchblade, Darkness, Cyberforce, and others (part of Image Comics). Publisher of X-O Manowar, Archer and Armstrong, Quantum and Woody, Harbinger, and other comic books. Some of the most interesting and creative comic books are being published by independent (indy) publishers. Even though many of these publishers are smaller in total number of titles, they may be the perfect way for you to get your foot in the door, if you want to make comics. Many of us broke into comics through indy publishers willing to take a chance on a new writer or artist. My first published work as a comic writer was all through independent publishers. Not all comic book publishers have clear guidelines for submission, especially independent publishers. In that case, the links I include here may drive you to an About page or a Contact page. If I haven’t found anything else, I will send you to the home page. Remember, not all small indy publishers are prepared to publishing anything beyond their own projects, so do your research. As with any publishing submission, read a few issues of comics that they have already published. You can get a sense for their publishing strategy by reviewing upcoming releases. Get as much information as you can about a publisher before reaching out with your comic book ideas. Also, know yourself. Do you need to get paid to make comics? If making an income from comics, understand that a small indy comic publisher may not be able to meet your needs. Research your options carefully to determine the best creative and business fit for you. Publisher of The Ride, Body Bags, 25 to Life, Boondock Saints, R.P.M. Publisher of comics, prose books, and non fiction books, including Futurians. Publisher of Femforce and other comic books. Publisher of comics and digital comics. Publisher of Genie the Genius and a bunch of comics that I wrote a long time ago. Publisher of Gold Digger, Ninja High School, Airship Enterprise, and others. Publisher of Kade, Isis, and other comic books. Publisher of Fathom, Shrugged, Charismagic, and other comic books. Publisher of Die Kitty Die, Captain Canuck, Life Death & Sorcery, Agents of P.A.C.T. Publisher of Cla$$war and other comic books. Publisher of Mercy Sparx and other comic books. Publisher of many graphic novels. Publisher of Dollman and many horror movies. Publisher of Heavy Metal magazine and many graphic novels. Publisher of The Fifth Beatle, Tin Tin, and other graphic novels. Publisher of Knight Rider, Airwolf, and other comics. Publisher of Lexian Chronicles and other comic books. Publisher of Kolchak, Mandrake, and other comics. Publisher of ComicsLit, Boneyard, and other graphic novels. Publisher of Halo and Sprocket, Johnny the Homicidal Maniac, and other comics. Publisher of Destiny NY, Clonsters, Prison Witch, Modern Dread. Publisher of comic books and graphic novels. Publisher of Logan’s Run, 10th Muse, and biographical comic books. Publisher of Albion, Charley’s War, & licensed properties. Publisher of Sara, The 7 Deadly Sins, Goodnight Paradise, The Fearsome Doctor Fang, The Banks, and others. Publisher of Box Office Poison, Owly, Blankets, and many others. Publisher of science fiction, horror, and fantasy books and graphic novels. Publisher of comics history, comics journalism, and other fan publications. Publisher of CITY, BLAME!, Moteki, Arakawa Under the Bridge, Pop Team Epic and more! Publisher of Twilight & Maximum Ride. Publisher of Grimm Fairy Tales and other comic books. You have a better chance at winning the lottery tbh.